A rectangle pattern is a range of two horizontal and parallel lines when price consolidates between them and achieves at least two identical or very similar highs and two identical or very similar lows. Of course, the price can reach both support and resistance lines more often or it can just move in between as far as those 4 touches were done. The breakout occurs when price escapes from the rectangle crossing the support or resistance level. A prevenient trend should exist, although it can come from any direction. 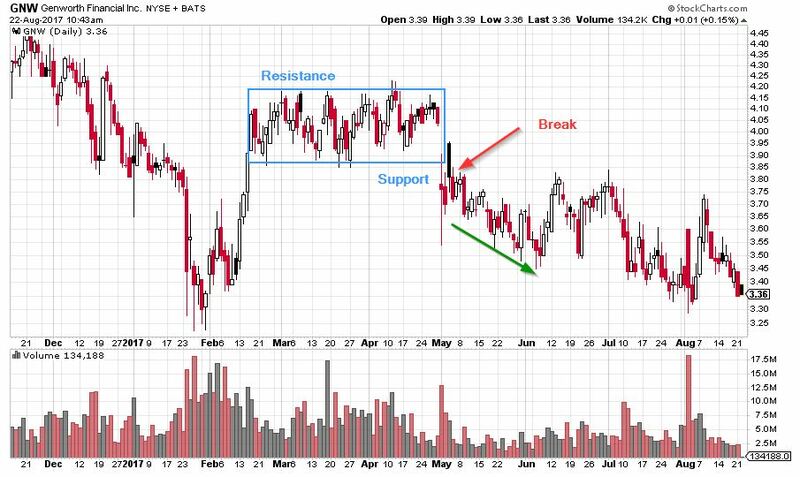 The same with break-out – it can happen via support as well as via resistance. Whether it is one or the other, we find out only once it happens. There are various different theories out there that claim a bullish or bearish trend with the pattern and thus, the breakout direction is focused based on previous price trend. Our theory denies this since empirical results show a pretty low break-out success rate of this pattern. However, when it happens and entry position is performed successfully, the output is very strong with significant profits. The length of the rectangle pattern should be at least a month and maximum 4-5 months. The volume is not relevant during the pattern development, however, increased volume at the break-out gives better confirmation and possibly more power to the price rise/fall afterward. The break-out is successful when price stays above the resistance or below the support level for a couple of days. A successful trader is going to wait for 2 days and enters a position on a third day if the price is still as desired. As with other patterns, the resistance may become the support and the other way, when price tends to retreat. A target price would be then driven until the current price is broken, this is usually at least the height of the rectangle. 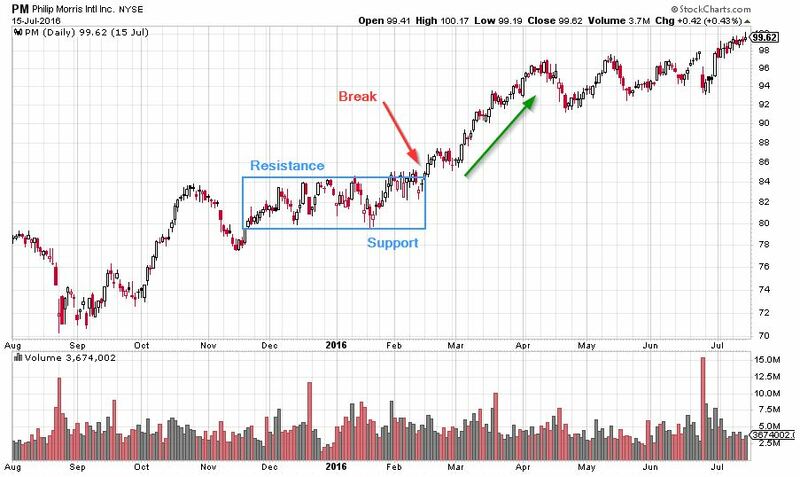 The traders with more risk appetite may trade the security inside the rectangle – buying at support and selling at resistance. These are usually the swing traders or the day traders – it is worth when the rectangle pattern is generally rather tall, so there’s enough space to drive the price. Above example of PM had a bullish prior trend and developed its rectangle between November 2016 and February 2017 with nice break-out via resistance and following price rise to significant levels. A successful trader takes a position in February at around 86 and leaves the position in April at 95 with significant profit.